You might know Darrell Dlouhy as a longtime Coeur d’Alene contractor and guitarist in the band The Renovators. You might know him from his involvement with the “No Moose Left Behind” public art project, or the campaign for McEuen Field redevelopment. Or as the father of Matt Dlouhy, the 2002 Idaho 5A basketball player of the year for Lake City High School. 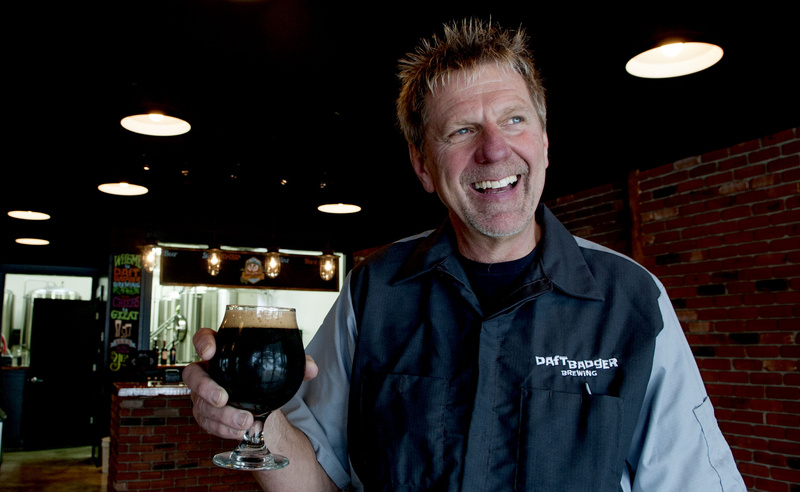 Now Dlouhy has a new role: owner of Daft Badger Brewing, the region’s latest brewpub, which opened Tuesday. Dlouhy has refashioned his former painting operation at 1710 N. Second Street in Coeur d’Alene (two blocks due west of Slate Creek Brewing) into a tasteful, inviting space with brick inside and out, fir tops for the bar and the high tables, large black-and-white photo prints of regional outdoor scenes and a heated patio out front under a covered pergola. Four beers are on the opening menu, with a fifth on the way. Badgers Bounty IPA (7.6 percent alcohol by volume, 109 International Bitterness Units) is fairly dry with lots of citrus in the middle and a piney, spicy finish from a combination of Simcoe, Centennial and Willamette. Hoppypotamus pale ale (6, 119) is sort of a dialed-down version of the same recipe, with a less complex but more pointed hop punch. The mellow Red Letter Amber (6, 47), starring Centennial and Amarillo, is soft, lightly sweet and nutty, with a dry finish. Hibernation Libation porter (7.6, 21), with the requisite chocolate and roasted coffee notes, will be joined soon by an imperial stout dubbed Josiah’s Revenge (8.8, 11), after a pet badger in Teddy Roosevelt’s White House. It’s approachable for a big beer, rich and smooth with cherry and dark fruit flavors. Along with the main offerings, which will evolve, small-batch specialty brews also are planned from a half-barrel pilot system. “We want to do some crazy stuff,” Dlouhy said. The brewing is handled by Dlouhy’s son-in-law, former fireman Jake Capaul – Dlouhy bought him his first homebrew system some seven years ago – along with Keith Bertram, who worked with Dlouhy as a painter. Rounding out the team are Dlouhy’s wife, Val Samuel, and chef CJ Fox-Lopp, who has cooked at Tony’s and The Cellar. His menu features creative takes on pub food, utilizing an in-house smoker. Appetizers include a Daft Platter of meats and cheeses, fennel-accented salmon crostini, smoked bacon in a stout-spiked huckleberry chipotle glaze and pulled pork nachos. There also are three salads – arugula, garbanzo bean and mixed greens – and four sandwiches, with pulled pork, smoked turkey, smoked jalapeno cheddar sausage and a BLT. Wine and cider will be available along with the beer. Oh, and about that name – Daft Badger might sound like it’s stolen from an eccentric British pub, but it actually was inspired by the Internet-sensation honey badger video (“honey badger don’t care”). “We’re going to be relentless, like a badger, but we’re not taking ourselves too seriously. That’s the daft part,” Dlouhy said. No-Li Brewhouse, which has been sending beer overseas to Sweden, this week began exporting to Japan. • Orlison’s latest small-batch seasonal release is a Roast House Coffee Stout lager (5.5 percent ABV, 62 IBU) brewed with the Spokane-based roaster’s dark, rich Noir coffee and vanilla. • Twelve String has a High Note Black IPA (7.5, 81) with some peppery spiciness from rye malt and a complex hop character from a combination of Nugget, Chinook, Ahtanum, Columbus, Simcoe, Centennial and Amarillo. • Hopped Up’s Everyday IPA (6, 60) is a lighter-bodied beer brewed with oats and Magnum, Falconer’s Flight, Cascade and Zythos hops for fruity, tropical and lemon notes with an earthy accent. • The Extra Pale Ale (5.4, 50) at Perry Street has a dry, rich, biscuity malt body from Maris Otter and Munich, balanced by lots of dank Columbus hops and a touch of Cascade. • Slate Creek’s Sidewalk Surfer pale (5.8, 41), the first in a series of summer seasonal test recipes, is creamy and slightly sweet with a citrusy, piney hop character from Chinook, Citra and Amarillo. • Waddell’s Brewpub will tap My Nilla vanilla bourbon oatmeal stout (8.5, 25) – the winning recipe from the inaugural Battle of the Homebrews in Post Falls last May – in a release party tonight at 7. • Spokane’s Clover restaurant will host a six-course beer dinner featuring Post Falls’ Selkirk Abbey Brewing on Feb. 4. Cost is $65, plus tax and tip; call (509) 487-2937 for reservations. • River City celebrates its second anniversary Feb. 7 from 5 to 9 p.m. with specialty beers including a doppelbock, eisbock and the nitro Oako-Coco (Midnight Marmot imperial stout conditioned over oak chips and cacao nibs) along with food and live music. Send beer news, comments and questions to senior correspondent Rick Bonino at boninobeer@ comcast.net. For more local beer news, keep an eye on spokane7.com/blogs/ontap, and follow us on Twitter (@BoninoBeer).